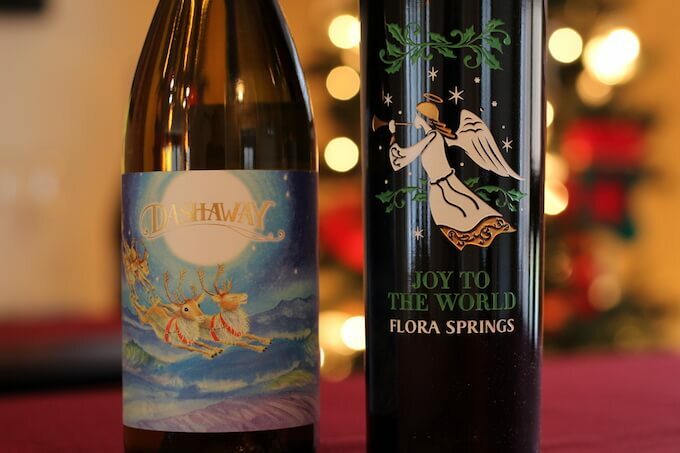 In this review, I’ll be covering two of Flora Spring’s holiday themed selections. The first, Dashaway, is 100% Napa Valley Chardonnay, aged seven months in French oak barrels and concrete tanks. The second is Joy to the World, a red blend made up of the following varietals: 64% Cabernet Sauvignon, 19% Petite Verdot, 17% Syrah. Samples of each received for review purposes. For more info on the winery, check out the Flora Springs website. Starting with the 2015 Dashaway, uncorking the bottle revealed an immediate and pleasant pear aroma. In the glass, Dashaway poured very light gold in color and a quick tip and spin left numerous slow falling legs. Up close the aroma was less of pear (though it was still there a bit) and more of a green apple note. Overall, the nose was light and pleasant, with little to no alcohol burn. Dashaway alcohol content 14.3% by volume, per the bottle, which explained the slow legs this wine had. When sipped, the pear re-emerged in the wine’s flavor along with a little light citrus. Quite tasty! The finish was long lasting and enjoyable with the flavors carrying the torch. Little to no bitterness to be found. Overall, I found Dashaway to be a lovely Chardonnay with just the slightest bit of sweetness, perfect to pair with holiday appetizers. Dashaway price $45.00 SRP. Per the tasting notes I received with this wine, Dashaway can be kept in your cellar through 2021. Next up, the 2014 Joy to the World red wine blend poured very dark purple with little light able to shine through. This wine was also quite leggy, though with thicker legs falling slowly down the sides of the glass than the Chardonnay. Joy’s aroma was a rich combo of tobacco and black cherry. Not overly pungent, but enjoyable none the less. There was just a muted note of alcohol in the aroma. Joy to the World alcohol content 14.2% by volume, per the bottle. The wine’s taste was rich and dark. I noted inky black fruits along with classic Cabernet Sauvignon and brown spices. Moderate tannins coated my palate leaving a cottony mouthfeel. Finish was long with a good starting balance between the flavors and the tannins. Towards the end of the finish, the tannins really settled in. Overall, I found this to be an enjoyable red blend that favored classic Cabernet Sauvignon flavors over the usual red blend flavors you get these days. Joy to the World price $65 SRP.